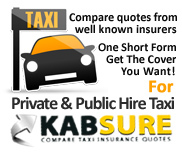 Private Hire Insurance - Compare private hire taxi insurance! According to Department of Transport statistics, there were over 155,000 private hire vehicles licensed in England and Wales alone! Private hire vehicles (PHVs) are often lumped in the same category as taxis (also known as hackney carriages) but they are different entities. Taxis: These vehicles are available for immediate hire and you can hail one on the street; a practice also known as ‘plying for hire’. Taxis have two types of license; a driver’s license and a vehicle license. The latter license is issued to the owner of the taxi. It is possible for taxis to pick up customers who have pre-booked the service. Private Hire Vehicles: It is illegal for PHVs to use taxi ranks and to ply for hire. These minicabs have to be pre-booked by customers. Along with the vehicle and driver’s licenses associated with taxis, PHVs must also have an operator’s license. An operator is the individual that accepts bookings and is the contact point for customers seeking a cab. These services can be provided by a licensed driver who rents a licensed vehicle or a licensed PHV owner who is also a licensed driver. Why Private Hire Insurance Is More Expensive? This is a real bone of contention among drivers since they already have to pay for their licenses, fuel and other costs associated with owning a vehicle and operating as a private hire vehicle driver. Insurers calculate the cost of premiums based on a number of factors and whenever they deem the motorist’s risk to be higher, they increase the cost of the insurance. Private hire operators cover more miles than the average motorist, often drive larger vehicles, carry large numbers of passengers, cover longer journeys and operate in congested areas. All of these factors combine to increase the overall cost of private hire insurance. The type of vehicle you operate dictates the cost because there are 50 ‘groups’ of vehicle according to the Association of British Insurers. Typically, private hire vehicles are larger than normal cars so this immediately bumps up the price of insurance. Due to Continuous Insurance Enforcement (CIE) regulations that have been made law since June 2011, every single vehicle on UK roads must be insured all the time. There have been major problems when it comes to the sheer volume of uninsured drivers so these new regulations were essential. Now it is impossible to get away without being insured because operating any vehicle without a minimum of Third Party insurance is completely illegal. The only way you can continue owning your vehicle without insurance is if you register it as ‘Off Road’ with the DVLA in what is known as Statutory Off Road Notification (SORN). Therefore, even if you only operate a private hire vehicle on a part-time basis, it is against the law not to have insurance. If you are caught operating a private hire vehicle without insurance, you will be hit with penalty points, be forced to pay a fine and your vehicle may even be taken away from you. Expect your operator’s license to be revoked and getting it back will be a tough task. You have the typical Third Party, Third Party Fire & Theft and Fully Comprehensive options available. Taxis can have Public Hire insurance as they pick up people from the street without pre-booking but private hire vehicles must have Private Hire insurance as they only collect customers after a booking has been made. Policy Only: This is the cheapest and most basic form of cover. The more names you add to the policy, the more expensive it gets so while it may seem like a good bargain; it might be costly if you run a large firm. Named Driver: This is the ‘middle of the road’ form of insurance and means you’re purchasing private hire insurance for yourself only and no other drivers are covered. Any Driver: This is the most expensive kind of insurance but it does allow any licensed motorist to drive your private hire car. Again, the more names you add, the costlier the policy becomes. Yet it is really the added extras that make sense for private hire drivers. It is unwise to rely solely on basic Third Party insurance as it doesn’t cover the cost of your damages should you be involved in an accident. As you will be transporting people; their safety is your concern and as you’re on the road a lot, it makes sense to have as much protection for your private hire business as possible. Here are some popular, some would say necessary, options. Once you have two or more vehicles, fleet insurance should be considered. Generally speaking, most insurers require you to have a minimum of three vehicles to be eligible for this option but there are exceptions. If you run a large private hire firm, you’ll be delighted to know there are insurers willing to cover fleets of up to 500 vehicles! Perhaps you started off with a single vehicle and purchased the requisite insurance. As your business grew, you needed a second and a third vehicle and had to purchase separate policies for them as well. While this is standard procedure, it is also rather inefficient. Ultimately, you have several policies for different vehicles all of which have their own renewal dates. This can be very confusing and expensive. When you choose fleet insurance, you are effectively buying insurance in bulk from a single provider and as you know, buying in bulk tends to save money. Additionally, most insurers give you a discount as a reward for your custom. Another great reason to buy fleet insurance is to insure every driver that gets behind the wheel of a company private hire car. Instead of having to wait for certain individuals to return to their licensed vehicles, you can have any driver taking charge of any vehicle. This will be an immense help when it comes to flexibility and ultimately, profitability. Third Party: Covers damages to other vehicles involved in accident. If the accident is your fault, there is no compensation due to you for any damages caused to you or the vehicle. Third Party Fire & Theft: Same coverage as above plus added protection if your vehicle is stolen or damaged by fire. Fully Comprehensive: Enables you to claim for any damages caused to you or your private hire vehicle and also covers the cost of injuries/damage sustained by the other party. This is the most expensive form of car insurance but it is the wisest choice for private hire firms. This is essential if you run a business of any size. It is designed to cover your business in case someone makes a claim of accidental damage to their person or property whether it occurs at your business premises or due to your business activities. Since transporting people from one place to another is your business, it makes sense to get protection against passenger claims. For example, if a passenger gets injured in a road accident and deems it to be as a result of dangerous driving or general negligence on your part, you could be sued for damages. If such a case goes to court and you lose, public liability insurance will pick up the tab. Losing a case without public liability insurance could ruin your business because you will be legally required to pay the entire award in full. It is common for damages of tens or even hundreds of thousands of pounds to be awarded. It is common for insurance companies to offer policies covering £1 million worth of damages. You need to carefully consider your limit because being under-insured is potentially a lot more damaging than being over-insured. If you have a contract with a local authority, you may be required to have a limit of £5 million to cover its terms and conditions. For most private hire firms, this is worth the extra cost since contracts of this nature can be very lucrative. As private hire insurance premiums are likely to be high to begin with, it makes sense to explore a few cost-cutting options. With approximately 50 groups, you can save a substantial amount of money by adding a few vehicles in the ‘lower’ insurance group as their premiums will be much lower. A Group Rating Panel comprised of Association of British Insurers and Lloyd’s Market Association members and insurance company representatives decide upon a car’s group. Factors include a car’s safety rating, value, cost of spare parts and repairs. High-performance vehicles tend to be in the highest insurance group. While you need to offer customers a semblance of luxury, it is important to consider the cost of insurance when choosing vehicles for your fleet. Most private hire firms won’t hire drivers with previous convictions; not just because of the added risk, there is also the small matter of higher insurance premiums. Even having a minor criminal offence which has no impact on your driving can be enough to see insurance premiums soar. According to some statistics, individuals with any form of criminal conviction are more likely to be involved in a traffic accident. Look to hire drivers who abide by the letter of the law and stick to basic rules such as remaining within the speed limit. Drivers with penalty points are very expensive to insure. Private hire firms are always happy to hire drivers with substantial No Claims Discount as they are far less expensive to insure. For example, staying claim-free for as little as 12 months could see a reduction of up to 30% on a premium. Drivers with NCDs of up to five years may be rewarded with a 75% discount. Savvy private hire firms sometimes pay extra to protect NCDs that have been built up; this practice ensures discounts are not lost if a driver has to make a claim during the year. Obviously, drivers who have held specific private hire qualifications for a certain period of time will also be rewarded with a lower insurance quote. If you are serious about being a success in the private hire industry, you may want to consider additional purchases. For example, breakdown cover should be a given considering the high mileage of your vehicles. Larger firms have a standard policy which ensures they are covered for a certain amount of breakdowns over a 12 month period. Such policies should have roadside assistance to help get your vehicle back on the road as soon as possible. Unlimited passenger liability is also a must to ensure protection for everyone in the event of an accident. As we mentioned above, public liability insurance should be considered to protect your business against claims of damage to people or property as a result of your negligence. If you are looking for the most affordable private hire insurance that provides you with an adequate amount of protection, you should look to compare quotes on PrivateHireInsurance.net. We have information relating to the cheapest and most comprehensive private hire insurance policies within the UK. Our goal is to help you save hundreds of pounds (or more) on your insurance policy and keep your business protected. The days of spending hours or longer contacting insurers are at an end. You can compare and contrast quotes from a select group of underwriters who offer the best value private hire insurance on the market. Now you can research your options and find the policy that suits you and your business the most. Best of all, you can do it while having a tea break!